Last Friday a cargo ship and a barge have collided in Houston channel. Currently the USCG is investigating the cause of the collision between the cargo ship Genius Star VII and a barge loaded with 840,000 gallons of fuel oil in the Houston Ship Channel. The damage caused to the cargo ship Genius Star VII is shown in the photo above. 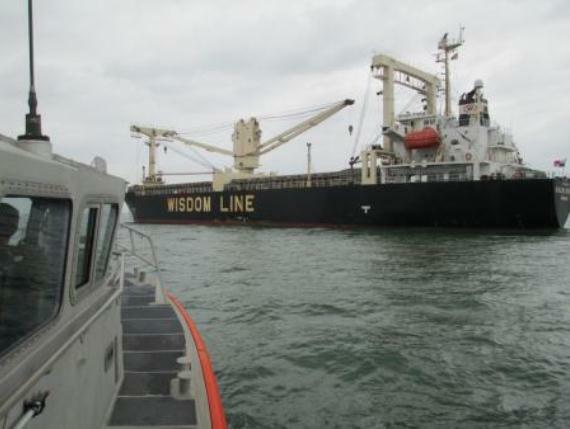 Watchstanders with Coast Guard Marine Safety Unit Texas City received a report at approximately 8:30 p.m., on Friday concerning a collision, which occurred between a loaded barge and a 394-foot cargo ship loaded with grain. Up until now there has been no report of injuries or pollution from either vessel. Both vessels are reporting damage, but are in stable condition. Marine inspectors and marine casualty investigators from Coast Guard Sector Houston-Galveston were dispatched to the barge to conduct a preliminary investigation and mitigate any risk to the environment. A response boat from Station Galveston was launched with a team of marine inspectors and marine casualty investigators from Marine Safety Unit Texas City to meet the Genius Star VII offshore and conduct a preliminary investigation, assess damage, and mitigate any risk to the environment or the mariners aboard the vessel. Coast Guard marine inspectors and investigators from Coast Guard Marine Safety Unit Texas City get a closer look at the damage caused by the collision. Currently the exact cause of the incident is under investigation.